This week’s theme includes pools and pool accessories, tools, car accessories, and Father’s Day gifts. 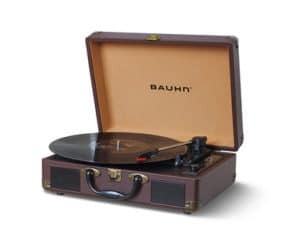 Bauhn Portable USB Turntable, $49.99. This is basically a record player. It’s available in Black or Brown and features 3 speed settings. You can play back music on a USB flash drive and convert the record or aux-in into MP3 format. It plays 33 1/3, 45, and 78 RPM records, and it has RCA output for the ultimate stereo listening experience. 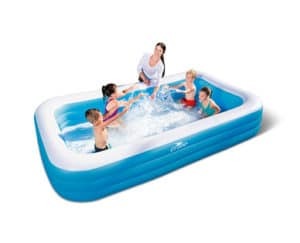 Crane Rectangular Family Pool, $19.99. This measures 10′ x 6′ x 22″ and has a water capacity of 307 gallons. It features 3 interlocking quick-release valves, sturdy pre-tested vinyl, 3 air chambers, extra-wide side walls, and a heavy-duty repair patch. It releases pool water with easy-to-use drain valve. We bought the H2OGO! version of this pool last year, and it didn’t hold air well for us; we eventually got rid of it. Read our review here. Summer Waves 45″ Round Pool, $4.99. Holds 25 gallons of water and comes in Blue, Pink, or Green. H2OGO! Inflatable Lounge, $4.99. Choose from Designer Fashion Lounge, Beach Bed Lounge, or Flip-Pillow Lounge. Intex Pool Lounge, $9.99. Measures 64″ L x 32″ W and comes in Blue or Green. Features built-in headrest, inflatable PVC-wrapped ring for durability and comfort, and a mesh bottom to keep you cool. Repair patch included. Intex Mega Island, $19.99. Choose from Unicorn, Flamingo, or Swan. Large lounging area fits 2 adults comfortably. Features two air chambers for added safety, durable handles to help climb aboard, and a repair patch. Big Joe Pool Petz, $24.99. Choose from Lobster, Turtle, Frog, or Starfish. Use to float on water or play on land. Floats up to 200 lbs. Filled with Big Joe Megahh Beans. Stearns Puddle Jumper, $12.99. For children 30-50 lbs. Choose from Pink Clam, Green Octopus, Teal Crab, or Blue Starfish. For use on boats, on the beach, or in lakes and pools. Adjustable buckle snaps in back. Can substitute for a type III life jacket. Read our review of a similar flotation device sold at Aldi last summer at this link. H2OGO! Triple Slide with Speed Ramp, $14.99. This is 18 feet long and connects to a garden hose, and three people can use the slide at one time. Included accessories: 2 ground stakes, 2 connectors and 1 repair patch. Crane Watermelon or Emoji Island Float, $14.99. Measures 74″ diameter and features all-around grab rope with built-in grommets, interlocking quick-release valves, sturdy pre-tested vinyl, and a heavy-duty repair patch. Lily & Dan Sneaker-Style Children’s Water Shoes, $3.99. Sizes 5/6 – 13/1 in assorted colors. Lily & Dan Toddlers’, Boys’, and Girls’ Swim Suits and Swim Sets, $6.99-$7.99. Assorted varieties in sizes 18 months through 6/6x. Workzone 1,850 PSI Electric Pressure Washer, $69.99. Features 1.2 max GPM, 20’ non-marring high pressure hose, 35’ power cord with GFCI plug, professional spray gun with adjustable nozzle, and on-board soap tank. Workzone 20V Li/Ion Drill Driver Kit, $39.99. Includes 1.5 Ah lithium-ion Samsung battery, battery charger, 3 driver bits, and 3 drill bits. Features 3/8” heavy-duty keyless chuck for quick and easy bit changes. LED work light illuminates your driving and drilling projects. Workzone 20V Li/Ion Cordless Power Inflator, $39.99. Includes 1.5 Ah lithium-ion Samsung battery, battery charger, 20” air hose, sports ball needle, and adapter for inflatables. Features 0-150 PSI pressure range for tires and small inflatables, along with 20″ hose with built-in storage clip. Workzone 20V Li/Ion Reciprocating Saw, $49.99. Includes 1.5 Ah lithium-ion Samsung battery, battery charger, 1 blade for wood, and 1 blade for metal. Features 0-3000 strokes/min. for smooth, fast cutting wood and metal, 0.875″ stroke length for maximum material removal per stroke, variable speed trigger for total control and easy starts, and anti-vibration housing to reduce arm fatigue. Workzone 1.6 Amp Detail Sander, $14.99. Workzone 20V Li/Ion Circular Saw, $49.99. Includes 1.5 Ah lithium-ion Samsung battery, battery charger, six 1/2” 18T carbide-tipped blades, blade change tool, and adjustable rip fence guide. Features 0-45 degree bevel capacity for mitered cuts, maximum RPM speed 4300, laser guide for precise cuts, and adjustable depth for cutting a complete range of wood. Workzone 4-Piece Pliers Set, $12.99. Workzone 5-Tier Heavy Duty Chipboard Shelving, $39.99. Workzone 16″ High Velocity Fan, $16.99. Easy Home Petite Dehumidifier, $24.99. Protects up to 1,100 cubic feet. Approximately 8 oz. per day at 80°F, 80% RH. Features transparent detachable water tank and auto stop with LED indicator. Great for bedrooms, bathrooms, kitchens, and closets. Auto XS Wet/Dry Car Vac, $16.99. Features 1 gallon tank, flexible hose, filters, crevice nozzle, wide nozzle, and a brush nozzle. Plugs into any standard 12V DC power cigarette lighter socket. Auto XS Universal Fit Floor Mat Set, $9.99. Comes in assorted colors and fits cars, trucks, and SUVs. Features rubber heel pad for durability in high-wear area. Includes 2 front and 2 rear floor mats. Auto XS Premium Auto Cleaning Kit, $19.99. Features on/off hose adapter, premium wheel brush, telescoping flow-through brush, window squeegee, microfiber noodle brush cover, and a wall mounted organizer. Auto XS Pop-Up Car Sunshade, $4.99. Standard or Jumbo sizes. Features 50+ ultraviolet protection factor. Two-piece set easily folds into compact size. Visage Men’s Electric Shaver, $19.99. Features extendable long hair trimmer, rechargeable battery, and 60-minute operating time with fully charged battery. Triple shaving system includes a dual shaving foil and integrated long hair trimmer. Includes detachable shaving head for easy cleaning under running water, Travel lock, LED display with battery and plug symbols that includes charging indicator, Notification to recharge the battery, and Operating control displays. Accessories: power adapter, storage pouch, cleaning brush and protective cap. Read our review of a different shaver from Aldi at this link. Skylite Ultralight 28″ Suitcase, $49.99. Measures approx. 24.8″ x 18.5″ x 31.5″ and includes adjustable telescoping handle, four 360° spinner wheels, spacious main compartment with packing straps and mesh pockets, 2 exterior front pockets with zipper closure for extra packing flexibility, top and side padded carrying handles, and integrated TSA lock. Made of damage resistant polyester. Available in Gray or Navy. Skylite Ultralight Carry-On Suitcase, $39.99. Measures approx. 21.3″ x 14.2″ x 7.9″ and weighs only 4.2 lb. Features adjustable telescoping handle, four 360° spinner wheels, spacious main compartment with packing straps and mesh pockets, 2 exterior front pockets with zipper closure for extra packing flexibility, top and side padded carrying handles, and removable combination lock. Made of damage resistant polyester. Comes in Gray or Navy. Crane Foldable All-Weather Disc Slam, $19.99. Includes 2 foldable disc slam targets, 1 molded disc and a carry bag. Features two 19″ x 19″ x 20″ foldable all-weather disc slam targets with built-in scorers. Weighted base for added stability. Pembrook Father’s Day or All-Occasion Card, $0.99. Black Angus USDA Choice T-Bone Steak, $7.99 per lb. SimplyNature Organic Grass Fed 80% Lean Ground Beef Patties, $4.89 per lb. Sweet & Smokey Cedar Plank Atlantic Salmon, $9.99 per lb. Jennie-O 90% Lean Ground Turkey, $6.99 for a 3-lb. package. Auto XS, Bauhn, Big Joe, Crane, Easy Home, H2OGO!, Intex, Jennie-O, Lily & Dan, Pembrook, Simply Nature, Skylite, Stearns, Summer Waves, Visage, WORKZONE. Bookmark.